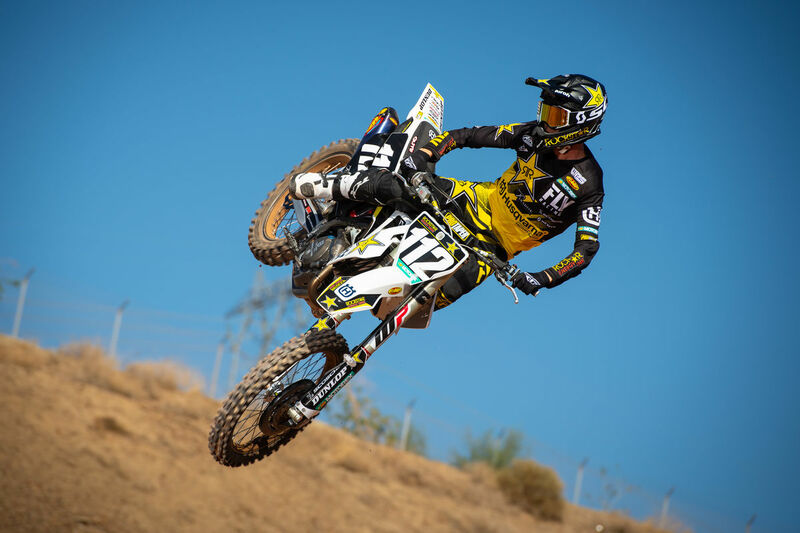 Long-time MX2 GP rider, Thomas Covington, has been training at the Carmichael compound in preparation for his supercross debut this weekend in Minneapolis. Speaking to Grant Langston on the Whiskey Throttle show, TC said: “I used to train down here at Carmichael’s a bit when I was younger, Jeannie (Carmichael’s mum) helped me out a bit when I was on 65s, and 85s. When I decided I was going to do East coast I felt like I needed to ride on some tracks with similar dirt so I called Ricky and Jeannie made a deal with them to come down here and ride and I think it’s one of the best decisions I’ve made. I really needed to practice here on the soft soil and hit the whoops when they aren’t all blue-grooved and slippery, I think this is more similar to what I will see at the first round as well as getting to ride with some good guys. “I’ve been doing motos with Martin Davalos, it’s been really good in one way, he’s one of the best, most experienced guys out there but at the same time it’s a little bit demoralising watching him hit the whoops lap after lap because he is pretty incredible. The track we are riding at now has two sets of massive whoops, which is good practice for me but it makes a big difference on lap times whether I hit it good or not. Some days I will leave the farm pretty pissed off after Martin smoked me! That’s not something I’m used last few years in Europe, usually I was , if not the fastest guy on the track, pretty close in lap times to any other GP guys that are there. Covington played down his chances of doing anything special or going for a title in his first year of supercross. “It’s been going pretty good,” explained Covington on learning supercross especially since he doesn’t have much previous experience. “I haven’t been on a supercross in pretty much five or six year, I dabbled a little but with it when I was an amateur and raced Monster Cup a couple of times but other than that I’ve riding outdoors and getting into the GP season the last few years. “It’s been a pretty steep learning curve for me but it’s good to have the team I have a around me and helping me set-up the bike and pointing a few things out. It’s going as well as a I can expect, just struggling a bit with the whoops, but we are getting better every day, hopefully we will have everything on track by the time the first East coast round comes around. Covington has a pretty stacked field to face with Austin Forkner, Martin Davalos, Christian Craig, Chase Sexton, Alex Martin and Justin Cooper all capable of winning races in a series that looks like it could be deeper than the West coast.